We are proud to feature and market the Patterson’s Registered Berkshires™ that make up a large part of our weekly pork sales. 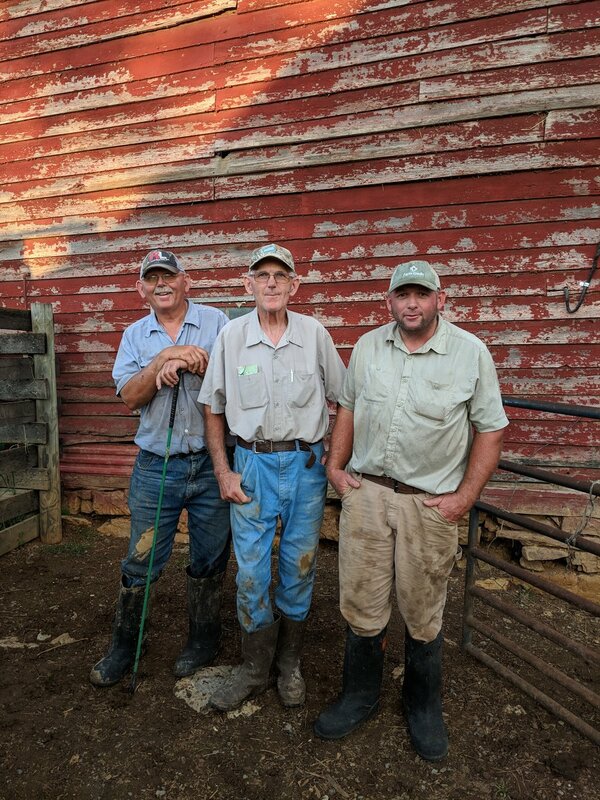 It is rare this day in age to be able to work with long time friends and neighbors like Bill, John, and Crawford Patterson who have such a long standing and respected history as true artisans in an ever increasing commodity farmed world. Their farm located here in the beautiful and fertile Shenandoah Valley has received numerous awards for both environmentally sustainable and innovating farming practices before these kinds of methods were popularized in documentaries and became trends that were imitated. No designer mud boots or cliche farmers market straw hats here, just generations of hard work and cultivated knowledge. This story starts and ends on the same soil that Patterson’s have been stewards of for generations. In a world where we are now accustomed to 15 second videos and getting our news from glancing headlines, the history of the Patterson’s Registered Berkshires will sit you down and captivate you with a story that sounds more like something of legend with generations of artisans, grand champions, and tales of English royalty. The Registered Berkshires raised today on the Patterson farm have genetics tracing back to Royal English Berkshire lines. The Patterson’s farm on the same land that their grandfather raised Registered Berkshires on starting all the way back in the 1920’s. This generational commitment to purebred Registered Berkshire genetics and the preservation and development of a heritage breed hog is unmatched. The Patterson’s have produced Grand Champion award winning Registered Berkshires. Keeping this breed pure allows its superior qualities of marbling, fat, and taste that it was so cherished for to continue. Many new and old farms in this market are in it for the revenue and “heritage breed” is merely a key word and selling point. It is common for competing farms to purchase hogs from a livestock auction that sources from all over the country with hogs having unknown genetic backgrounds or farming practices. The hogs are then simply onsite for a few months or even weeks to put on additional weight before slaughtered and sold as “heritage breed pork” raised on a sustainable farm. When marketed and sold as such, one might be under the impression that the products and commitment are equal. If you have a commitment or desire to investing your money toward awarded sustainable farm practices while preserving and advancing the generational pure breeding of the world’s prized heritage bred pork then the Patterson’s Registered Berkshires™ are unmatched. The Berkshires are raised outdoors year round amidst forage and sunshine that is a necessity in creating this quality product. A majority of the supplemented grain and feed the hogs consume is nonGMO and raised, harvested, and stored by the Paterson's themselves onsite. That in itself is a huge undertaking and commitment of time and labor. These animals are raised with care and love that is obvious by their gentle and docile disposition. Groups of hogs are walked from their pasture to the barn every week to be individually weighed and hand selected for our weekly orders, sale, and delivery of fresh heritage bred pork. These hogs live an active life outdoors enjoying the room to roam in an environment that would seem like a resort after viewing the common commodity farming practices. Cruelty is unnecessary and there for inexcusable. Because of this dedication to raising hogs from birth for generations you get to see the whole story right before your eyes when customers come visit and see where their hogs actually come from. The transparency is a principle here and always empowers customer’s love for the product. Bill, Crawford, and John Patterson.